SKU: WS270. 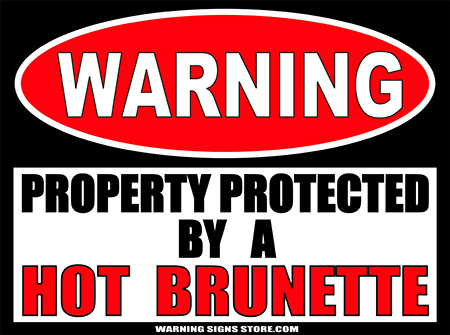 Categories: Military Signs, Novelty Signs, Warning Signs. Tags: Marine, Warning Signs. 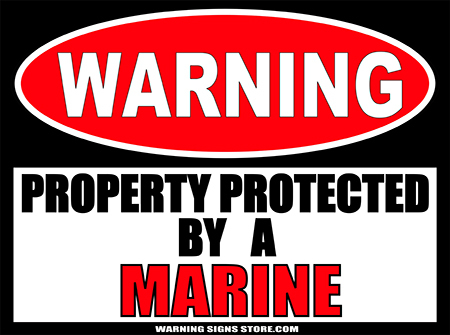 Got a Marine protecting your property? U.S. Marines, also known as Devil Dogs, Jarheads, and Leathernecks, can protect your property like no other! Ukraine, Turkey, Thailand, Tonga, and Romania. and then there’s Portugal with the 2nd oldest existing Marine Corp.
And then there’s the Phillipines, Paraguay, Pakistan, Netherlands, South Korea, Italy, Indonesia, Greece, Hondurus, Germany, El Salvador, Columbia, France, China, Argentina, Chile, …. and a lot more! What makes a Marine such a good property protector? Do you really have to ask? This sticker is great if you’ve got a Marine around, or it makes a great gift for any Marine you know. This Property Protected by a Marine sticker measures out to approximately 4.5″x6″. It is printed in a glossy finish with eco-friendly inks on a premium vinyl polymer. Our inks are UV resistant and designed to last 7-10 years, indoors or out.